Home » Blogs » Michael Brydon's blog » Watering restrictions: Are they too restrictive? Watering restrictions: Are they too restrictive? Most water systems do not attempt to accommodate peak demand because that peak is so short in duration and capacity (pipes, pumps) is very expensive. The simple fact that we can survive for so much of the year with so little water suggests that the peak is largely discretionary and can be managed. So, like all water systems, we use water restrictions to make sure everyone is not watering their lawn on the same day. If that happens our reservoirs go dry, our fire hydrants become useless, and our expensive pumps run overtime. Better, I think you would agree, if everyone plays along. Having said that, are we too restrictive on the West Bench? The watering restrictions for the West Bench can be found here. The window for manual watering is 6-9 AM and 6-9 PM. I have had other people complain that this is unrealistic. I have talked to Roger Huston, the new RDOS Manager of Public Works, and he says we may have some flexibility. The key is to discourage watering during the heat of the day. We can tweak this, but I want to hear from you first. Any comments or questions about West Bench watering restrictions. You can post a comment below, contact me at mbrydon@rdos.bc.ca, or talk directly with RDOS Public Works (contact page). I cannot maintain the 2 horses I have on my 1.79 acres with the watering restriction. It doesn't make money but it keeps the weeds down. If I an unable to use my 8 gal/min. I will have to send the horses away. (maybe I could just turn them out with Joeys horses) lol. Seriously the restrictions were clearly sent without considering those who maintain farm status. I'm certain I don't need to remind you whom the original home owners were and why they were granted the size of parcels they were. I can live with the watering restrictions, but I do wonder how it is that governments (i.e. Penticton) can lecture about watering when their own park sprinklers come on during the heat of the day. [The former City of Penticton water steward] and I used to hide our heads when these complaints came in. The RDOS is just as guilty too. The standard reason is that the park irrigation (or public space irrigation) is subject to continuous damage and vandalism. Having it on during the day allows park staff to fix any issues. This avoids having broken heads running full out gushing all night. This is true in West Bench – but horses are the main culprit for damaged irrigation. So there is some method in this madness. Anyone who owns one knows that automatic irrigation systems are a disaster waiting to happen. The damage can be massive if the systems fail at night or when the homeowner is not home. The advantage we have as homeowners is that we sleep near our irrigation systems. Night is really the most practical time to monitor these systems (assuming we sleep lightly and can detect the sound of water washing away our property). Our park employees do not generally sleep in out parks so there is a balance between evaporation avoidance and more serious water losses (and property damage) due to leaks, breaks, and failure. The discussion is centered around West Bench watering system but those of us who live in Sage Mesa are governed by the same water time table – and I have similar concerns re the timing. Can this discussion/accommodation extend to Sage Mesa watering system or do we have different water management problems that make it difficult to combine the two? The only reason I focused this inquiry on the West Bench is because it tends to have larger lots (1.6 acres was the target size for the VLA project). I am not sure how many Sage Mesa lots are that large. But I appreciate that many of the same issues apply for manual watering even on smaller lots. Having said that, I know that the Sage Mesa has serious capacity issues (especially with the golf courses) and management of irrigation timing is critical. We will look into this. Of course another issue is that the RDOS has no control over the Sage Mesa water system. We merely provide services for the province, who currently oversees operation of that system. Of course, the province might consider any recommendations we make on the topic of water restrictions. Turfgrass does not need anything like three hours of water every other day and in fact I strongly suspect that many people are overwatering so much that their grass is suffering from nutrient leaching. Given that much/most of the soil on the Bench and Sage Mesa is high in clay content as well, overwatering just causes puddling and compaction, especially if large animals are on it. I suggest that people put out small cans (tuna, cat food) and check how much water their lawns and pastures are actually getting. Check the internet and you'll find that overwatering is consistently noted as a more serious problem than underwatering. Here's a bit from one website. "One inch a week is the standard water requirement established for most lawns; however, this will vary between different turf species and even among cultivars within a specie. There will also be varying water requirements for seasonal changes and still more differences brought about because of different soil type. Verify watering quantities with the same measuring can method described above [in the site, but as I (Eva) noted also above], except you will want to note the time it takes for the cans to collect a specific amount of water. For example, if 0.5 cm (0.25-inches) collects in 30 minutes, you can easily calculate that it will take one hour to apply 1 cm (0.5-inches) of water or two hours to apply 2.5 cm (1-inch)." I am one of the property owners on a large lot 2.33 acres and we are trying to utilize almost all of it for our horses. I find the restrictions do not work especially since we seem to get a lot of wind during the evenings which would be a real waste if I tried to water then, which I try to avoid, but sometimes the wind comes up after sprinklers are on! GRRR. I own my own business, do lots of volunteer work and we are on the manual method of irrigation so I am often not even home during watering times. I try very hard to water only what is needed and am trying to improve the soil as well for long term water conservation. 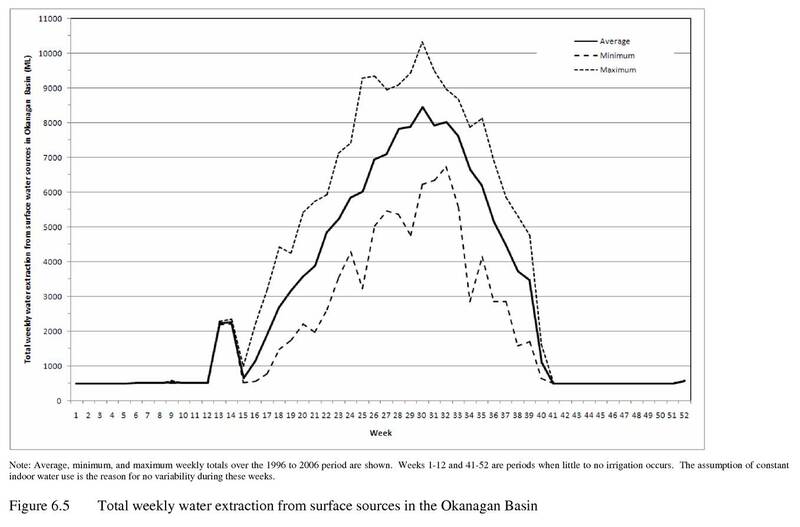 Rethinking water restriction times would be beneficial as I am sure I am not the only one with an active schedule. Somtimes every other day is to much. I sympathize with those with big lots that don't have automated underground irrigation installed as watering turns into a second job with the restrictions in place as they are. I watch my neighbors struggle to abide by this every year and feel for them as they are in their 80s. Maybe its time for local government to step in with some sort of grant/subsidy system to help people install more efficient systems? The savings to individual owners and the environment would be monumental! Thankfully, I have a automated system and leave my lawn longer in length to retain moisture . However in an ideal world I would like to water every 3rd day when I can as sometimes the lawn and fruit trees just don't need it every other day but can not survive without shocking a fourth day. Every other day is not ideal on many occasions, however I understand the reasoning behind it even if it forces me to use more water than I would ideally like. Good point, most the recommendations I have seen are for deep watering 2 x per week. I set my own system for a 4-day interval, which allows me to keep on the even/odd schedule. But as you say, four days can be a bit long in the hottest part of the summer. I added biosolids compost to my lawn this year in the hope of improving its ability to store water. We will see how it works. Thanks for the tip. I will look into trying this in the fall. I am however somewhat hesitant as the last time I used a Compost from the landfill all it did was introduce invasive species weeds to my lawn that I am still battling (I'm quite sure it was not Bio-solids Compost). I am not the only one of my neighbors who had this issue a few years back. This year we have been working on Mulching my flower beds. A costly process but apart from the improved look, the reduced weeding time and water saving offset this a little. It seems to be going very well for retaining moisture. enabling me to reduce those zones running time.